I’m here to tell you that we’re heading towards the end of September already and half term is looming. 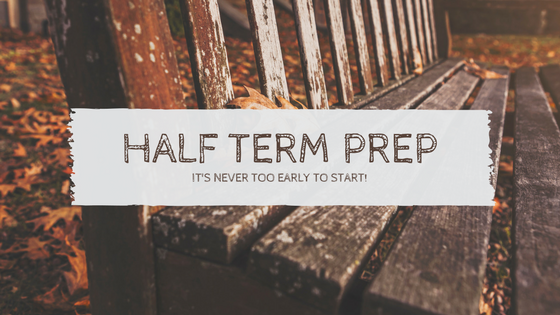 Now is the time to get an early start on your half term craft projects. I know you don’t want to hear it, you feel like they only just went back. Truth is hard, time is flying and before you know it they’ll be having half term parties or Halloween trick or treat gatherings! So now really is the time to start thinking at least about what you want to do. 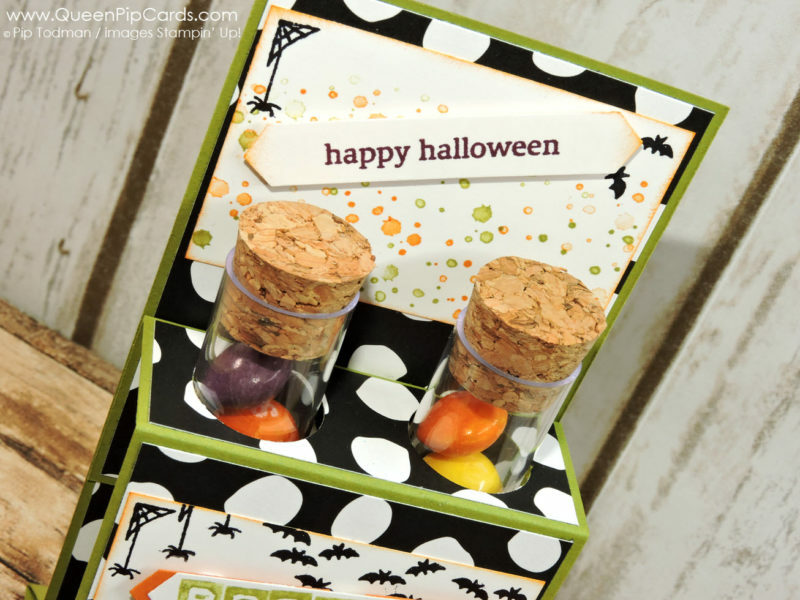 Here are some simple ideas that are a lot of fun, quick to make and pack a punch in the cute and themed department. We’re playing with treat tubes today – or test tubes as I knew them!! Thankfully these are made from plastic, so no worries about glass breaking and cutting people. I saw a variation of this on Facebook somewhere and I decided to create a couple for Halloween because I know there are a few of you out there that celebrate or have children attending parties or going Trick or Treating. These gifts are quick and easy to put together and don’t cost much for you to put on, but will give you “super mum” status! You could give them a whole Harry Potter theme and use them for an Autumn birthday party too! Cut Old Olive card stock 30.5 x 6.5 cm & score at 14, 16.5, 24.5, 26.5 cm along the long side. Adhere all your paper pieces first before assembling your holder. Once the papers are in place and before assembly, punch 2 ¾” circle holes in the piece that will fold over & become the top – these are where your test tubes will sit. 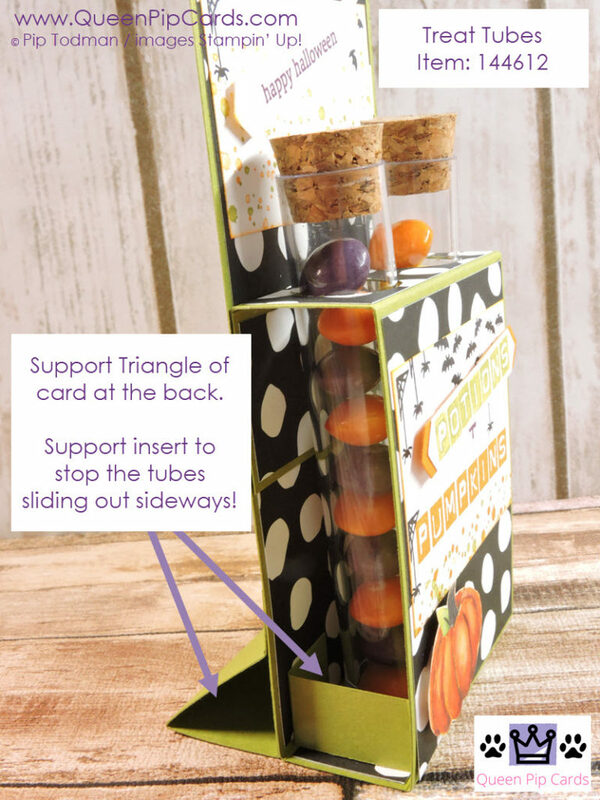 Fold all your score lines and attach the last piece to the back to form your holder! If your holder is a little floppy, then add a piece of cardstock to the base at the back, as a triangle to give it a firmer base. Decorate as you wish! I used a mixture of old & new stamps because I don’t purchase Halloween sets, but this would look awesome with the new Halloween set with a Cat sitting on the outside! Or an Owl perched on it! 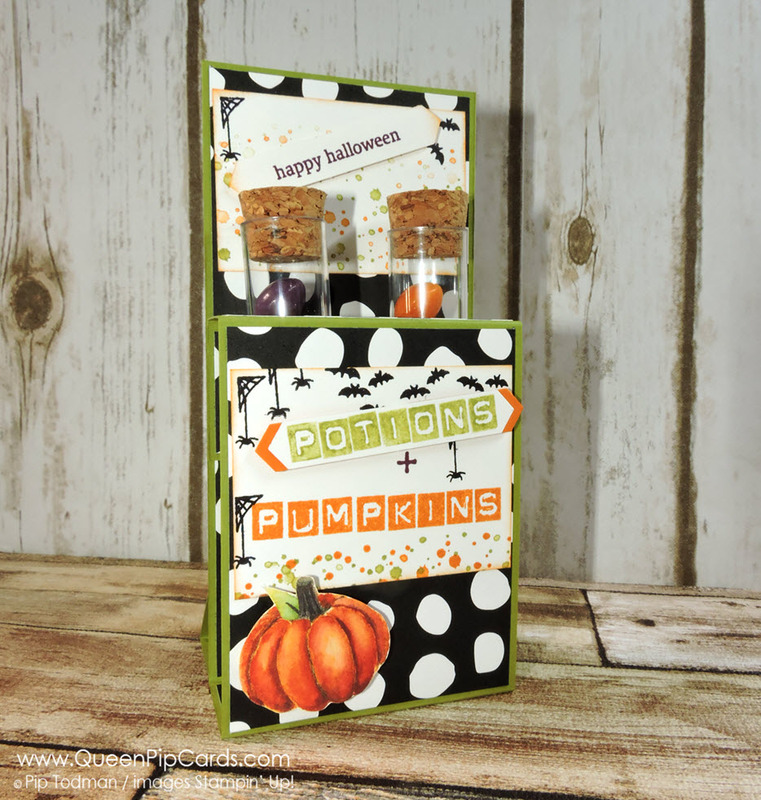 The bubbles on the stamped pieces are from Timeless Textures and the words Potions & Pumpkins I created with the Labeler Alphabet stamps. For a simpler but still cute option, here’s one with the Seasonal Chums Tag Bundle. 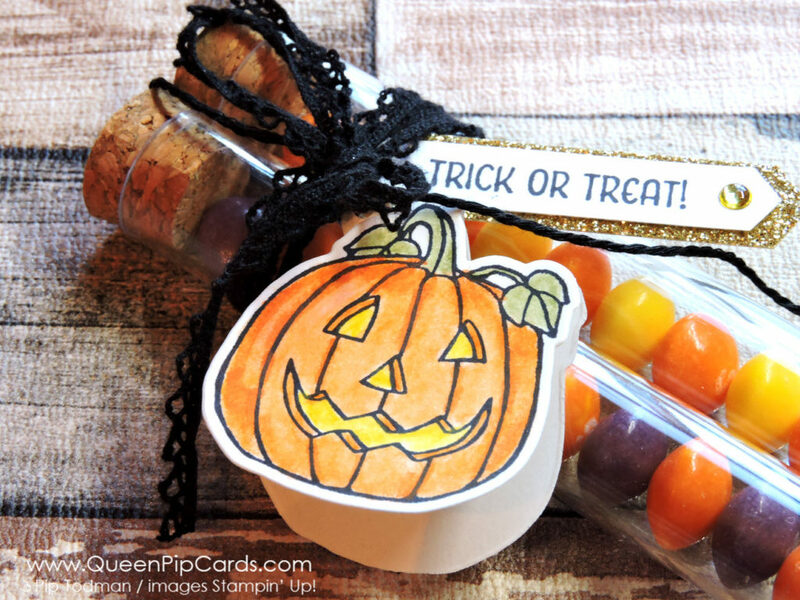 Stamp and die cut your tag and attach with some seasonal ribbons to your Treat Tubes. Add the sentiment backed onto some Gold Glimmer paper! It’s such a quick and easy to do project, but don’t you think they look great? You get 12 tubes for £4.50 which means this treat is just 75p plus the sweets (and this was less than half a pack of Skittles!) These half term craft projects you can do together as a fun afternoon activity when it’s raining outside! If you’d like to make some, I recommend the products below. Just click to go to my shop.